MycoGold® Cotton Blend is the only biological cotton seed treatment dry inoculant that provides the combination blend of Beauveria Bassiana, Mycorrhizal Fungi, Bio Stimulants, Azospirillum/Azotobacter Bacteria and a group of highly effective micro-nutrients. These two biological fungi work symbiotically with the plant to produce a larger more efficient root system for better yields, provides drought stress protection, and defends soil pathogens and insects. The combination of Beauveria Bassiana and Mycorrhizal fungi work together providing the best cotton seed treatment inoculant tandem for your cotton crop. The Beauveria Bassiana helps defend against soil pathogens and insects. The mycorrhizal fungi increases the root absorption area 100 to 1000 times more than an untreated plant. The increased hyphae, or root hairs created my Mycorrhizae allow for better absorption of P and other immobile nutrients. The chelated micro-nutrients give your cotton that boost during the initial growing stage allowing for a head start over control that pays dividends. Azospirillum/Azotobacter bacteria helps generate nitrogen for non-legumes. Last but not least, the Bio Stimulants in chelated form accelerate and promote the growth process. MycoGold® Cotton Blend is a dry powder biological corn seed treatment inoculant. Mix MycoGold® Cotton seed treatment evenly with seeds when filling seeder using grain auger or directly in the hopper or other container. It's worth noting the talc carrier helps lubricate your planter equipment. 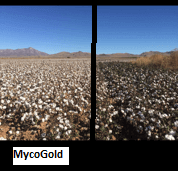 MycoGold® Cotton Blend biological cotton seed treatment will stimulate and increase the root system for a much more robust plant while aiding in defending against disease and insect pests. The bacteria will help generate 20 to 40 lbs. of Nitrogen per acre as a BNF (biological nitrogen fixation) which allows you cost savings in removal of starter fertilizer. MycoGold Biological Cotton seed treatment ensures your cotton has efficient water uptake, better nutrient uptake, and drought stress tolerance. Our tests have shown an average increase in yield of 11.2% in test trials. Mycogold is a fantastic product. 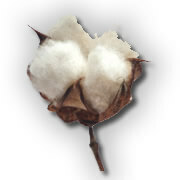 There is a big difference between Mycogold treated cotton and untreated. I received a 9% yield increase.